The Knight Citizen News Network just published an online guide to “Launching a nonprofit news site” co-authored by the leader of the nonprofit news site that partners with our School, the Wisconsin Center for Investigative Journalism. There’s been an explosion in the number of nonprofit news sites, and now you’re considering joining this exciting movement. Here’s a word of caution: You won’t just be doing journalism. You will be an employer, a manager, a grants writer, a negotiator and sometimes a bookkeeper. You’ll have a steep learning curve. But if you decide to go ahead, you’ll be in good company: Scores of enthusiastic and dedicated people have gone before you and formed journalism nonprofits that are carrying out good work. There’s another important UW connection in this report as well. Section five, “Establishing sound policies,” draws on the work of our own Center for Journalism Ethics. An ethics policy tells journalists who work for you, as well as the public and donors, about your organization’s values. Specifically, it addresses such sensitive issues as how you will handle anonymous sources, what you’ll do when a story involves a donor and how you’ll deal with conflicts of interest. This section is based on our report, “Ethics for the New Investigative Newsroom” released in April of this year. 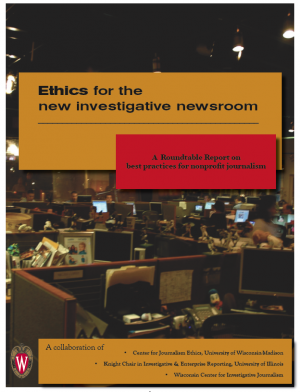 Ethics for the New Investigative Newsroom is a collaboration of three journalism centers: Center for Journalism Ethics, University of Wisconsin-Madison; Knight Chair in Investigative & Enterprise Reporting, University of Illinois; and Wisconsin Center for Investigative Journalism. It puts forward ethical principles and best practices. It outlines legal considerations and explores nonprofit journalism in Canada. The report warns that newsrooms must protect the integrity of their journalism. Only transparency about sponsorship, clear rules on conflicts of interest, and frank communication with supporters will maintain public confidence in these new experiments in journalism. Join the conversation — what are the biggest challenges and opportunities for nonprofit journalism organizations from your point of view?